On Sunday, October the 9th, the "Institute meets the neighbourhood" gathering was held in Teramo. The event was organised by the G. Caporale Institute to celebrate its 70th anniversary with residents, in the square opposite the Campo Boario headquarters. Local cuisine and entertainment were offered, with the presence of The Evidence musical band and Gianluca Pierannunzi. 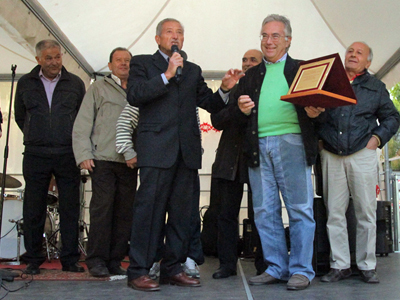 The director of the Institute, Professor Vincenzo Caporale, intervened and was later bestowed with a memorial plaque on behalf of local residents. The plaque read: "Our deepest and sincere appreciation for all the activities carried out with professionalism and commitment in these years of intense hard work." The event had a commemorative value as well as historical. Its spirit was to encounter the "Campo della Fiera" (also known as "Camposanto Vecchio") neighbourhood residents, together with Institute's former employees. The moment represented an occasion to share and express gratitude in the presence of those who have witnessed the birth and growth of this important scientific institution. The G. Caporale Institute's headquarters are located in the area of the fruit and vegetable market and the old municipal slaughterhouse. The latter was recently returned to the research structure becoming, by all means, an integral part of it.